Numerous adware programs are known to be roaming the web; one such program is called Candle Jar and should be ignored at all times. Make sure not to download or install it if you ever happen to come across it. During the research, our malware experts have discovered that this adware program is another installment of an infamous SuperWeb group, which is notorious for developing other adware programs such as High Stairs, Twinkle Star, Super Great, and many others. Therefore, it is not surprising that we highly advise you to remove the ad-supported program in question just like all of its counterparts. Do not take any chances with this adware even though you might come across claims stating that it could help you improve your online experience since it will have the exactly opposite effect. Make sure to delete Candle Jar as soon as possible by using the comprehensive removal tool crafted in a way to make the removal procedure as easy as possible. 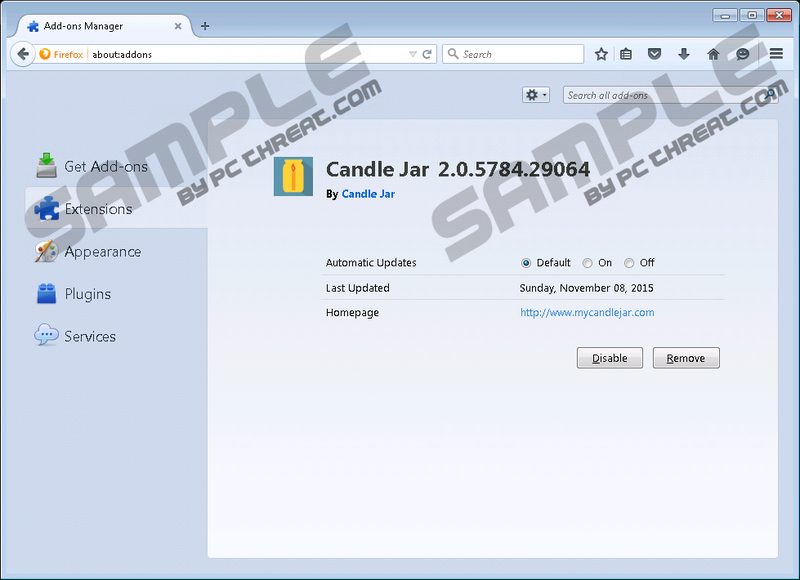 Just like any other adware program from the infamous Super Webb group, Candle Jar will almost instantly fill your web browser with annoying third-party web content. If you have experienced such behavior, it is a pretty strong indication that this ad-supported program is up and fully running on your PC. All the unwanted web content, which manifests itself as ads, pop-ups, and coupons, comes from various adware servers, which are well-known to be associated with malware distribution. Thus, it was not shocking to discover that some ads and pop-ups could turn out to be malicious. As it turns out, ads and pop-ups could contain redirect links. This is a dangerous instance to say the least because ads containing such links could lead you to suspicious or even malicious websites. For example, you could be taken to a fake online shop. Cyber crooks craft such online stores for one reason only – to steal your credit card data. If that was not enough, you could also land on sites that promote or host malware. It goes without saying, that the removal of Candle Jar is paramount to your virtual security. If you wish to keep your operating system safe and secure at all times, you must take a few preventative steps. First and foremost you need to implement a professional malware detection and removal tool since it is your best bet to keep your operating system safe and secure at all times. If you do not have such a tool active on your PC, there is a high risk of infecting your operating system. In addition to such a virtual security tool, you should bypass all questionable third-party download websites as they are known to provide bundled installers, which are infamous for being used by malware distributors to spread their questionable software. Lastly, make to never skip a setup step because this way you could miss an opportunity to cancel the installation of some dubious program. By taking these preventative steps, you will make your operating system virtually unbreakable. Do not hesitate to delete Candle Jar as it imposes various virtual threats. It is crucial to remove every single bit of this adware in order to stop its invasive activity entirely. You should conduct an in-depth analysis of your PC once you are done with the manual removal to be sure that no traces linked to Candle Jar are active on your PC. If you find such analysis of your computer too complicated to you scan your system with a reliable antimalware tool instead. Click the Search icon next to the Windows button. Select Candle Jar and click Uninstall. Right-click Candle Jar and select Uninstall. Confirm that you wish to remove it. Quick & tested solution for Candle Jar removal.